Strong Tower Security Consulting - Albuquerque, NM Are you prepared? Recently, in the news, there was an incident where a homeowner shot an intruder when he came home un-expectedly. The perpetrator had entered the home through the garage by using a tool to disengage the safety release handle. There is a simple way to make this next to impossible and it will only take about $1.50. These garage release mechanisms are fairly similar. If your doesn’t have two holes, you may need to create one or expand one. Take proper safety precautions, including eyewear when using power tools. 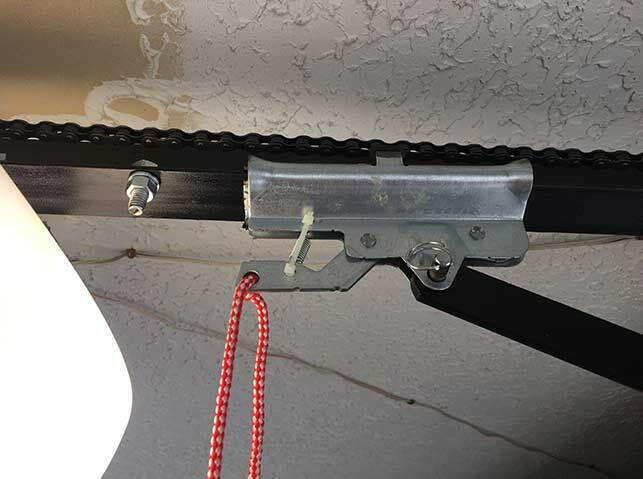 Get a ziptie, and strap together the quick-release lever. If YOU ever need to release it, just cut the zip. But, a criminal will have a hard time reaching and cutting this simple precation. © 2019 Strong Tower Security Consulting - Albuquerque, NM. All Rights Reserved.